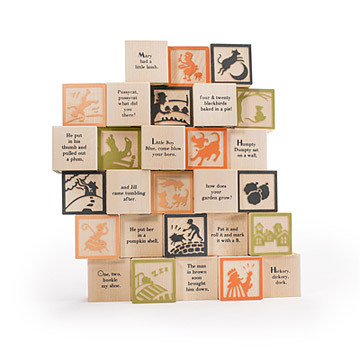 This set of handcrafted blocks tells twenty-eight classic Mother Goose rhymes with embossed images and words. Beautiful craftsmanship and design. Small enough for little hands, but big enough to read the text and see the detail in the pictures. Love the environmentally responsible philosophy behind the company and the fact that they're made in the USA. I will be ordering the dinosaur set for my oldest son, who absolutely loves dinosaurs! Really high quality and cute. Nice and lightweight and good size for little hands. Can't wait for our son to open on Christmas they are absolutely beautiful. Clever idea for Grand-Niece. Thanks for offering cute and unique gifts! Will be a gift for an upcoming baby shower for my daughter-in-law. Can't wait for her to see them. Perfect gift for baby's first birthday! Not your ordinary blocks! A new and fun way to play with blocks for years to come through development!